Agency employment costs are the biggest threat to operating profit margins, the latest Kingston Smith W1 survey reveals.By Ian Graham. 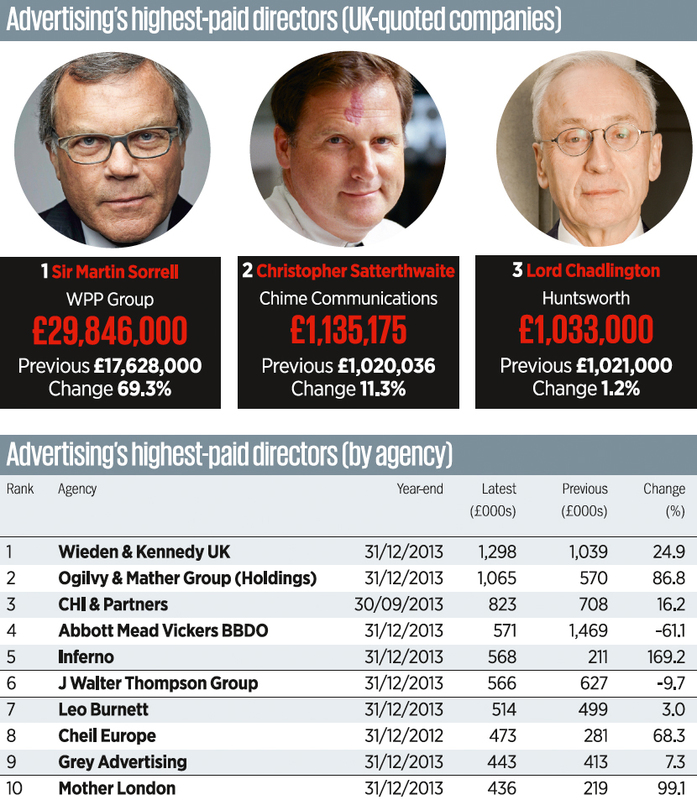 As Kingston Smith W1 previously predicted, the UK’s top 50 advertising agencies have reported a disappointing set of results, according to their most recently released figures. While income continued to increase – with top-line results up 5 per cent on the previous year and now standing at more than £1.4 billion – this actually represents a slowdown in growth and, once the effects of inflation and some merger and acquisition activity is taken out, the like-for-like growth has been much weaker than expected. Most results are for the 2013 calendar year and, despite the recent surge in completed deals in 2014, there were comparatively few during this period. Most of the growth arose organically and the top 50 agencies benefited from new client wins and increased spend by existing clients. Despite the increase in overall income levels, operating profit margins have suffered again this year. The average operating profit margin fell from 11.2 per cent to 10.7 per cent. This is the lowest average margin that we have seen across the top 50 advertising agencies since 2005. We believe that well-run agencies should be targeting an operating profit margin of at least 15 per cent, with 20 per cent as a top-end target. While there are a number of agencies that have achieved this goal, as a sector, there is clearly a long way to go, and a further fall away from this target is disappointing. What is more worrying both for agency owners and, indeed, their staff is that this fall in profit margins has not come as a result of upward pressure on wages – average employment costs per head rose by only 2 per cent, which was broadly in line with inflation. Overall staff numbers have risen by 4 per cent across the top 50 agencies, which has resulted in an overall increase of 6 per cent in employment costs. This means that employment costs, on average, now make up 60.3 per cent of gross income. This is the highest percentage for this ratio that we have ever reported in 22 years of conducting the survey. We recommend aiming to maintain this ratio at 55 per cent or lower, but this is clearly proving a struggle for many agencies. The pace of technological change across the whole industry shows no sign of slowing, methods of delivery are constantly changing and agencies are having to fight hard to stay ahead of their competition. The need for an increasingly broad base of skills is likely to be one of the main factors contributing to this, but it is entirely possible that, across the sector generally, staff numbers increased in anticipation of stronger growth than what was actually delivered. As a result, there may be some capacity to service further growth without a corresponding increase in staff numbers. On the other hand, with a subdued marketplace and minimal wage growth in the past few years, there could well prove to be a significant spike in average salaries as demand for quality people picks up. While meaningful growth in employee average earnings will be very welcome for many, it is going to present a significant challenge for those trying to restore the financial fortunes of the agencies they own or run. As well as profitability, we also looked at agency productivity – the amount of income that is generated, on average, by each member of staff. This measure has improved slightly to just more than £111,000. We recommend agencies target £120,000 per head, and it is pleasing to see a further improvement towards this target. Operating profit per head, which is the measure that combines both productivity and profitability, and gives us a good overall sense of the financial success of the sector, fell by 4 per cent to £11,836. This was to be expected, given the poor operating profit margin average, and is drifting ever further away from our target of £15,000. The performance of three agencies stands out this year, having exceeded our three top-end financial targets by generating in excess of £120,000 of income per employee, keeping their staff costs to within 55 per cent of their income and reporting an operating profit margin of more than 20 per cent. They are Abbott Mead Vickers BBDO, DDB UK and Saatchi & Saatchi Group. It is a disappointment that no independent agencies hit all three of these targets this year and, if the current rate of acquisition activity in 2014 continues, it is difficult to imagine that any independent agency hitting these targets would not be subject to some serious attention from one of the acquisitive groups. Overall, while we have seen some modest income growth, it has perhaps been slower than expected and harder to deliver. Agencies have clearly been investing in more staff and, while costs per head have barely kept up with inflation, this has had a knock-on effect on profit margins. With employment costs now accounting for a larger percentage of agency income than ever before – and with pressure in this area only likely to increase – it is going to take a very concerted effort by agency principals to improve overall margins in the coming years. 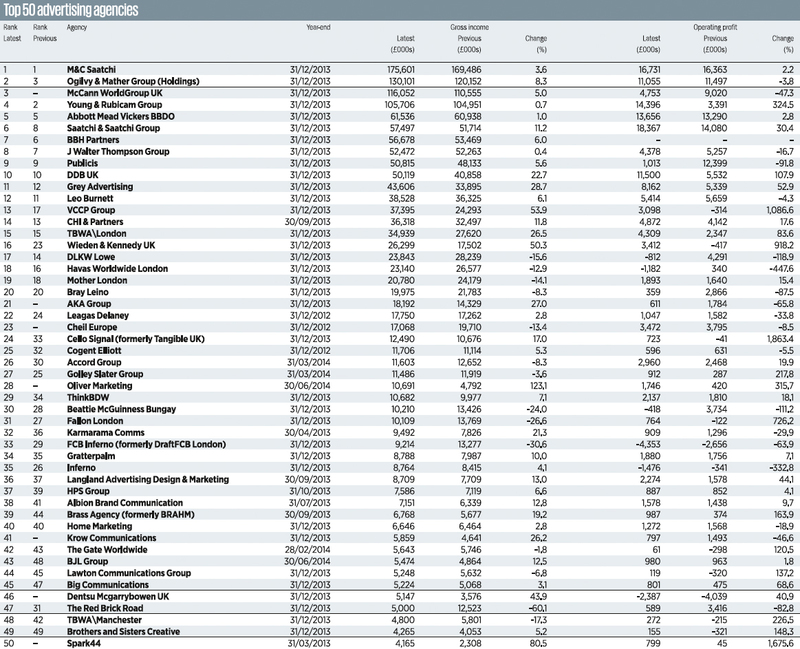 In contrast to the advertising sector, the top 30 media buyers reviewed in the Kingston Smith W1 annual survey showed improvement across almost all of the key financial metrics. Gross income levels rose by 11 per cent overall, with 26 of the top 30 showing at least some growth. More than half of the companies included posted double-digit growth, which was very encouraging and laid the foundation for improvements in our key measures for both profitability and productivity. The average operating profit margin increased to 15.9 per cent from 14.9 per cent and was significantly higher than the margin reported by all of the other marketing disciplines. While that is obviously good news for media buyers, generally the results are still significantly down on the 2009 peak of 22 per cent. Employment costs per head actually fell during the year by 1 per cent to £58,345. It is much more likely that this is a result of an increase in the number of relatively junior people being employed than being down to a genuine fall in wages. But it also strongly suggests that there have not yet been the across-the-board, above-inflation salary increases than we would expect to see as the industry climbs out of recession. Staff costs consumed 56.9 per cent of total income, compared with 57.4 per cent in the previous year, and it is this improvement that has resulted in improved profit margins. We recommend a target of 50-55 per cent and moving closer towards this target will be the key to enabling a return to the premium margins recorded in 2008-2009. Agencies are investing in staff to ensure that they have the skills base to deal with the rapid rate of change in the media buying sector and it is good to see that operating profit margins have increased from the previous year. However, agencies will need to continue to find alternative income streams to continue to improve profitability and productivity if they are going to remain the most successful sector financially.